As part of our New Media Research Practices course, we have been working on a final project consisting of a set of five posters. 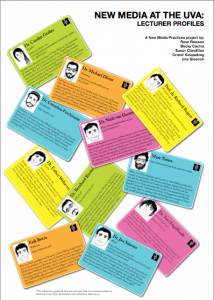 These posters primarily aim at clarifying material covered in the New Media Theories class, and the wider context of new media theory in general. 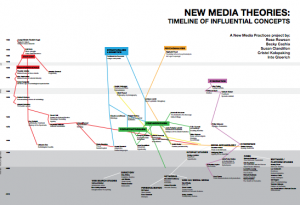 The topics visualized in these posters include pertinent new media debates, lecturer profiles for New Media at the University of Amsterdam, a media theory timeline, a network of new media theorists and a new media flowchart. As a group of Dutch and international students, we recognised the difficulty of situating concepts from the theories class into a wider framework. 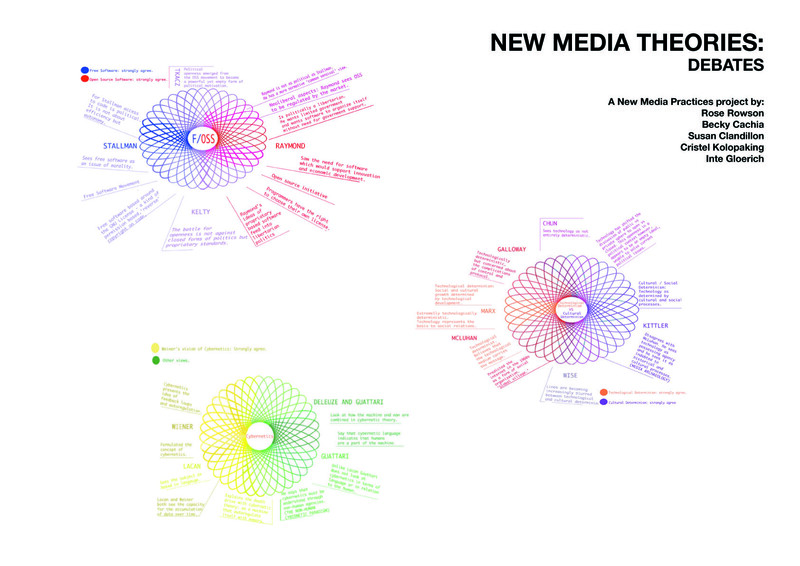 We wanted to indicate links between theorists and to draw a more complete picture of new media theory in general. We also recognised that there was a lot of assumed knowledge at the start of the course, and we identified this as a potential problem, especially for those students who had not undertaken the bachelor course in Media and Culture or who had no background in New Media. When working on these posters we combined knowledge gained in the theories class, with methods learned in the research practices class. 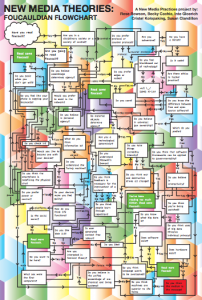 These methods included network graphing, mind-mapping, flowcharts and colour-coded data visualization. 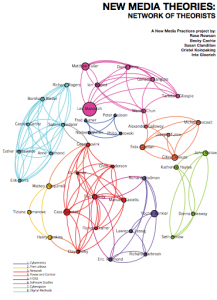 We combined these methods with different software applications including Gephi, Adobe Illustrator, and Adobe Photoshop.